Copyright © 1996-1997 Balmoral Software (http://www.balmoralsoftware.com). Portions copyright © 1996 GTE Vantage Inc. All rights reserved. Republication, redistribution or conversion is expressly prohibited without the prior written consent of Balmoral Software. Contents subject to change! For the latest information, see http://www.balmoralsoftware.com. Timelapse is definitely one of the better adventure games released in recent months. Large in scope, it contains several diverse and detailed environments that are a real pleasure to experience. Its playability is reminiscent of two all-time favorites from Sanctuary Woods, Buried in Time and The Riddle of Master Lu, from both of which Timelapse borrows some concepts. Puzzles are well-integrated into the overall storyline, which is fully fleshed out with background material available in the Professor's journals and in other areas of the game (notably Atlantis). The puzzles tend to be more abstract than the standard inventory-manipulation types often seen in adventure games. Their level of complexity seems just about ideal - not so easy as to lack a challenge or sense of accomplishment, but neither unreasonably difficult. In most cases, the game challenges "play fair" - solutions are logical and usually involve objects close at hand. This latter characteristic is particularly enjoyable since a lot of repetitive wandering and pixel-searching can be avoided. Only a couple of the puzzles involve arcade-style dexterity or a time limit for solution. Gameplay is fairly nonlinear - typically several goals must be completed in each age and often there is some flexibility as to their order. Like Myst, the ages themselves can be completed in any order, but the writings in the Professor's journals do suggest a "natural" sequence. Once an age has been completed, it cannot be revisited, so in a sense Timelapse consists of several independent sub-games. Four ages must be completed before the final game sequence can begin. Graphics are pretty good, but many scenes seem a bit on the blocky side. The sheer number of views that needed to be rendered for this large game may have limited the number of polygons used. However, many of these views seem somewhat redundant and gameplay often requires passing through a lot of intermediate nodes in order to reach the next decision point. In a few areas of the game, a "hyperlink" feature is available to bypass these intermediate nodes, but an optional "zoom" feature such as that available in Myst would have been more universally useful. Additional shading and/or shadowing would have given better depth to a number of scenes that appeared rather flat, in some cases making it difficult to sense directions for movement. Overall, however, it is easy to become immersed in the various ages due to their layout and particularly to the sound effects, which are excellent. 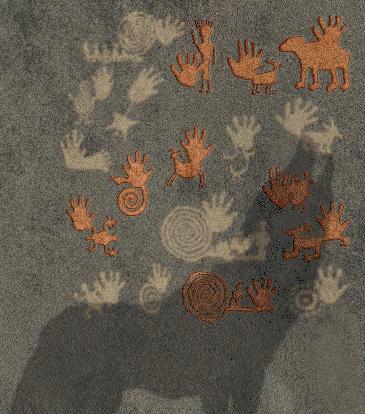 In addition, there are frequent spots throughout the game, particularly in the Anasazi world, where small animations of animals can be seen, adding a really nice touch of realism to the game. The game has two serious flaws. The first, and more annoying, is the requirement to re-insert CD #1 whenever the game is restarted. An introductory playback that is optional and user-selectable might have kept the initial sequence small enough to be repeated on each CD. The second is a failure to parity-check a randomized sliding-piece puzzle in the Mayan world, causing half of all configurations to be unsolvable (which often cannot be detected until the puzzle is nearly finished). Live-action acting is very good overall, with the exception of a rather amateurish performance by the actor protraying Professor Nichols. The background music is adequate, not particularly noteworthy except for a really outstanding music-and-vocals piece that is played in the Storyteller Cave. The user interface is just about as close to perfection as possible, using keyboard arrow keys (or mouse) for movement, combined with a Myst-like mouse cursor for exploration and object manipulation. A rosette of available movement directions is displayed when the arrow keys are being used, but disappears once the mouse is used for movement. This arrangement is reminiscent of that used in Sanctuary Woods' The Journeyman Project Turbo and Buried in Time, but avoids cluttering up the screen with extraneous items and graphics. A single item may be carried around as inventory. A control menu is turned on or off with a simple press of the spacebar. Saved games are file-based and unlimited in number, and thankfully include an overwrite warning. There are a few places in the game where you can be "killed", but at these points the screen is merely blanked and you are returned to the game, definitely a plus for those of us that have been burned in the past by not saving our games often enough. Overall, Timelapse is a very enjoyable adventure game experience. After watching the game introduction, you find yourself on a rocky hilltop of Easter Island. 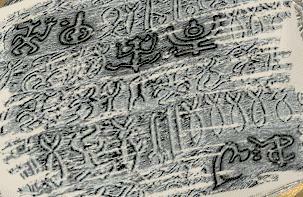 From your initial position facing the rocks covered with glyphs, move R F2 R F and pick up Professor Nichols' camera. The camera can be used to capture up to 36 partial screen shots during gameplay, and comes in very handy since many puzzles in Timelapse have graphic clues. Move B R F2 L F5 R F. Pick up the Professor's journal at the base of the statue. Be sure to read it for clues and background information while playing the game. Pick up the box of safety matches from the table and move B R F L F2 R F17 to the cave entrance. Move B L F and click on the now-glowing eyes of the face in the cave wall to open an entrance to the time portal. Move F7 and listen to the Professor's message. After he finishes, wait a few moments for a second message to start. At this point it's possible to visit any of three worlds: Egyptian, Mayan or Anasazi. To follow the Professor's path, press the brown scarab beetle button at far left, then click on the animation in the crystal ball to be transported to the Egyptian world. There is a separate section in the Professor's journal for each world you visit in Timelapse, so be sure to consult it on arrival in a new world (or later if you prefer discovering things on your own). From your initial arrival in the Egyptian world, move F7 R F L and click on the hanging basket exactly four times to fill the stone cistern. Move L F R F R F2 and observe that the cistern is completely filled. Move B2 L F R F and touch the pulley lever overhead to align the well bucket with the cistern outflow pipe. Click on the gray lever to empty the cistern water into the bucket hanging in the well and notice how the tension increases on the rope. Move B R F2 L F L and click on the hanging basket exactly two times. Move L F R F2 R F and again click on the gray lever to add water to the well bucket. Moving F, you'll see that the bucket is now completely filled and slightly tilted. Back out and return the pulley lever to its vertical position. Move B L F R F3 L F to the dock release lever. Drag this lever to the left to open the dock and release the barge. Move L F R F R F3 to cross the river in the barge (the Esc key can be used to skip the animation, if desired). Move L F L2 and pick up the spear from the dock. Move R2 F to face the crocodile guarding the dock temple. Wait until the crocodile moves his head to your left, then use the spear to jab at its pale neck area. After several stabs to this area, you will vanquish the crocodile. This surely must be a clue! Next, move F L F to the fruit baskets. Pick up the mirror from one of the baskets, back out and use it on the wall ahead to disclose a warning about trying to take the mirror out of the temple storeroom. Move R and use the mirror on the six jars at this end of the storeroom. 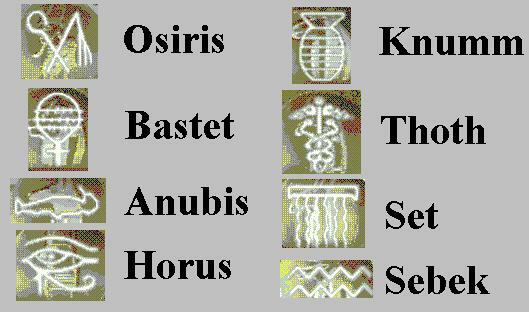 In the second one from the right, the mirror discloses a hidden scarab-shaped key; take it. Move R and use the scarab key to unlock the chest. Then move F and open the chest. Check out those cursor-tracking eyes! Continue into the crystal room at the end of the walkway. Here you will find eight crystals corresponding in relative position to the eight obelisks along the marble walkway. 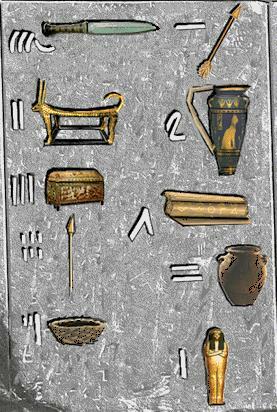 Zoom in on each crystal and set the animal symbol (top), adjusted numeric value (middle) and sign (bottom) for each of the Egyptian gods using the Animal Table, the particular Adjusted Value Table for your gameplay, the Egyptian number system and the Egyptian god signs given above. When each crystal has been correctly configured, the corresponding miniature in the raised pool at the back of the crystal room will glow. After all eight crystals have been configured, pick up the red crystal from the pool at the back of the crystal room. Move B F5 to the cobra blocking the passageway. Show the red crystal to the snake and it'll disappear. Move F9 and drop the red crystal into the blue-green pool. After you've finished watching the Yul Brynner impression, back out twice from the pool and press the small square staircase symbol on the column. Since you've already routed electrical power to this section of the temple complex, a spiral staircase opens. Move F R F6 R F10 R (past the Guardian apparition) and click on the chutes-and-ladders game rules on the wall. To play the game, move B F and roll the tetrahedron-shaped die. Your ankh is the red one; to win the game you must reach the final golden square (by exact count) before your blue opponent does. It's usually a better strategy to give up gems rather than accepting a position penalty from a snake, but to do so you must quickly drag the red gems on the wall to the right side where your opponent's blue gems are stored. The number of gems that must be transferred from the left side of the wall to the right is indicated by the number of marks on the snake's platform. Be sure to accurately position your gem into one of your opponent's open holes, or else the snake will knock you back. There is no click-ahead buffer for this game, as there is, for example, when reading the Professor's journal. Also note that the game is completely reset if you back out from it. Back out from the diagram and click on the gene pod lying in the gray receptacle. After watching the video sequence, move B3 L F and click on the rotating blue spot to watch another video sequence. Move F10 L F6 L F17 to exit the crystal room. Use the hyperlink icon to zoom to the dock temple, then move R F2 L F2 L F L F3 R to the power panel. Click on the upper, triangular button to send power up the river to the pyramid above the dock area. Click on the triangle at left to open the lock. Move F11 to enter the time portal. Watch the movie of Professor Nichols, then wait a few moments and watch a second one. 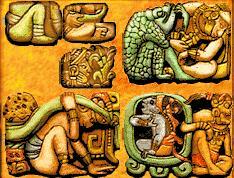 At this point it's possible to visit either the Mayan or the Anasazi world; we'll go to the Mayan world next. Press the green lizard button second from the right, then click on the animation in the crystal ball to be transported to the Mayan world. From your initial position on the beach, move R F4 R and click on the sea monster's head. Pick up the carved egg and move B L F5 L F5 R F14 to the steaming platform in the pool. Place the carved egg onto the platform and it will change into a chameleon. Click on the chameleon to play three rounds of a color-sequence/music-tone memory game (randomized for each game and each round). Move F4 into the Castillo temple. Turning the left inner ring turns the left outer ring in the same direction. Turning the left outer ring turns the left inner ring in the same direction and turns the right ring in the opposite direction. Turning the right ring turns the left inner ring in the same direction. Turn the left inner ring in either direction to bring the target left inner ring symbol into position. to bring the target left outer ring symbol into alignment with the left inner ring symbol. to bring the target right ring symbol into alignment with the other two target symbols. 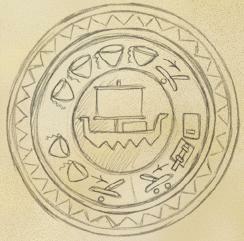 When all three target symbols are aligned, a bright musical chord plays and the corresponding temple shown on the map below is unlocked. 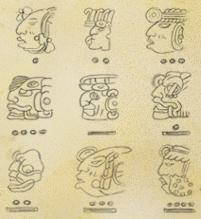 From the Mayan calendar, move R F R F2 R F2 R and note that all four temple access symbols are now lit up on the frieze in the crystal skull alcove. Move R F2 R F13 R F8 R into the skull temple. Obviously, a humerus must be placed before its radius and ulna, a femur before its fibula and tibia, etc. Also note that the skeleton's left femur is broken and must be reassembled using two pieces, as is its right humerus. In these cases, be sure the edges of the broken bones match up. The skeleton's right fibula, tibia and foot can be placed as a single unit, as can its left radius, ulna and hand. However, the skeleton's right radius and ulna must be placed individually, creating sort of an "X" arrangement. The hand with a single arm bone attached to it is not used. 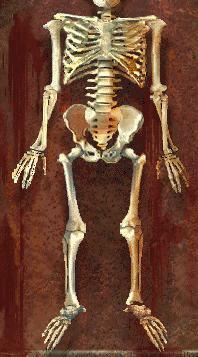 Generally, bones on the skeleton's left side have a slightly more brownish color than the ones on its right. When the skeleton is complete, the extra unused bones will disappear. Remove the green crystal ball from the skeleton's mouth, move L2 and place it in the center of the circular wall design. After the movie is done playing, note the two Mayan figures now visible in the wall design. 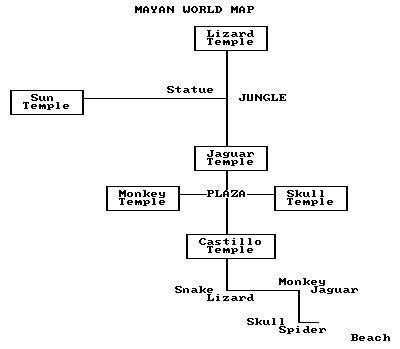 Move L F15 L F3 and click on the monkey skull to activate the PacMan-like game in the monkey temple. Move L F to start the game. The object is to move your green spider to the blue crystal at the bottom of the maze, while avoiding the red spiders in the narrower passages (relatively easy to do since their movements are predictable). Several areas in the game are isolated from one another, so most of the time you're just trying to move from an entrance hole to an exit hole. As in most of the puzzles in Timelapse, you can save your game after part of the puzzle has been solved, which avoids having to start over completely if something goes wrong. With this feature, even the most difficult puzzles can be solved incrementally. Once you've got the blue crystal, move B L F4 to the monkey wall design. Put the blue crystal in its center. After the movie is done playing, again note two Mayan figures now visible in the wall design. Move B R F L F and note the arrangement of four yellow symbols surrounding the jaguar picture on the wall. Move F and set up these symbols in the segmented circle, using the four-color scheme above. When the correct arrangement is selected, the cylinder opens up and you can pick up a golden jaguar head. Move B2 L F L F and melt the jaguar head over the fire. Cool the mold with blood from the small gray container. Move F and wait about 70 seconds for the gold heart to cool enough to pick up (or you can use this time to further explore the temple). Move B2 R2. Put the heart into the the pot of blood on the green statue; pick up the red crystal. Move R F R and place the red crystal into the center of the circular wall design. After the movie is done playing, note the two Mayan figures now visible in the wall design. You must win three rounds of the game before your opponent does. Each round is won by the first side to win three encounters. Your opponent seems to adapt to your prior gameplay, so one strategy is to pick your choices for each encounter on a purely random basis and save your game after winning each round. Back out from the game and watch the chasm bridge raise up. Move F30 L and pick up the orange gem from the pink plant on the tree branch. Move L F and put the gem into the right-hand eye socket of the statue. Move R and wait a few seconds for the spider to drop down; pick up the green gem in the center of the web. Move L and put the gem into the left-hand eye socket. Push on the right socket and take the machete from the mouth of the statue. Click on the machete four times to chop down all the brown vines immediately to the right of the statue. Return the codex page to the floor and move R F7 R. Put the cracked heart into the yellow bowl to activate the crocodile/tree puzzle. Move F. The object of the puzzle is to light up each of 22 positions on the double pyramid, while using the moves indicated by the skulls. This problem would be extremely difficult to solve without the aid of a computer (and several hours of CPU time); fortunately, a solution was seen on the codex page. 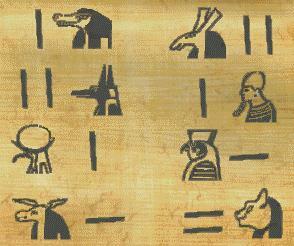 Click on the left (positive) and right (negative) skulls in the left-to-right order shown on the codex translation above, and pick up a golden salamander. Move B L F. Open the floor hatch and place the golden salamander into its receptacle. Move B F12 L F9 L into the lower temple region. Pick up the Mayan gene pod. After the movie sequence completes, pick up the axe. Unfortunately, the green storage unit acts like a counterbalance and since the gene pod and axe have been removed from it, stalactites have lowered from the ceiling blocking your exit. You will need to find the correct combination of bones and debris from the floor to place on top of the green storage unit to cause it to be depressed the correct amount, releasing the stalactites and allowing you to leave. Of the 256 possibilities, the correct combination of objects is: all four skulls, plus the flat brown piece. Match these tones by using the skull axe on the five stalactites, and the doorway will open. Move F4 to the tomb. You need to get the yellow crystal ball from the hand of the skeleton, but he just doesn't want to let go! While holding down the mouse key, rapidly move the cursor up and down over the skeleton's hand until you've tugged the ball free (amidst a particularly juicy sound effect). Move B R2 F24 to the circular wall design. Place the yellow crystal into the center of it. After the movie finishes playing, note the two Mayan figures now visible in the wall design. Move R2 F4 L F26 R2 and press the green eye of the jungle statue to avoid being killed by a poison dart as you move to the left. From a position facing the statue, move L F12 and then turn around by moving L. Pick up the purple gem hidden in the base of the tree fern. Move R F10 to the sun temple entrance. Place the purple gem into the center of the design that holds each of the four crystals you've previously found. By examining the puzzle, you should be able to figure out which of the four temple designs is missing a piece, corresponding to the open square in the puzzle. Obviously, that temple design must be completed last. Once a 2 x 2 temple subsection is completed, its design "freezes", making the occupied squares inaccessible during further work on the puzzle. As a result, a good strategy is to concentrate on configuring the first 4-element row and first 4-element column of the puzzle before completing any 2 x 2 subsection (as long as this is not where the missing piece is). The frequency of these outcomes indicates that the Timelapse game software is not checking the puzzle randomizations for basic parity; consequently, half of all starting positions will be unsolvable. In these cases, it will be necessary to restart the puzzle from the beginning. Once the sliding-piece puzzle has been solved, move F9 into the time portal. Watch the movie of the Professor, then wait a few moments and watch a second one. Press the blue insect button second from the left, then click on the animation in the crystal ball to be transported to the Anasazi world. The Anasazi world has a challenge to solve for each of these compass settings, and each challenge has an associated animal that will appear when the calendar lever setting is selected. As you progress up the canyon, you'll follow a friendly gray squirrel, the animal associated with the East challenge. About halfway up, you'll see a nest of bees in a dead tree trunk; use your stick to get a bit of honey on its end. Continue on up to the end of the path, where you'll discover a golden acorn trapped in a rock crevice. You'll have no trouble recovering the acorn using the stick tipped with sticky honey. Take the acorn back to the end of the road, where you found the stick, and place it into the depression in the rock. Move F3 into the cave and pick up a safety match from the box in the basket (seems a bit out of place or time, doesn't it?). Move B2 R and ignite the match by quickly passing it over the flat rock with the vertical slit in it. Then immediately use it to light the pile of twigs next to the rock. 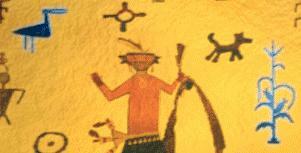 If you turn around, you'll see an important Anasazi symbol projected onto the cave wall. Using the Anasazi map, return to the calendar control lever and set it for South. From your position facing the calendar lever, move B R F9 R F R F4 R F5 and pick up some arrowheads on the ground to the right of the path. Continue F6 L and watch the animation of a hawk flying through a hole in a canyon rock spire. Move F to the mounted bow and touch the bowstring to load a blunt arrow. Find the arrowheads you're carrying at the lower right of the game window. Load only the first (smallest) of these arrowheads (two remain, but won't be needed). Save your game at this point. Your goal is to shoot the arrow through the same rock spire hole that the hawk flew through. A sweet spot obviously exists for a successful shoot, but there is some evidence that its location may be randomized between different games. However, if you need to restore your just-saved game, the sweet spot should be consistent, so the problem is to find the aiming point for your particular game. We found best results were obtained by using only the first (smallest) of the arrowheads. The other ones vary in size, and so require different aiming positions for the point of the arrowhead. The other two arrowheads also seem to vary in weight, affecting their flight characteristics. We found the best bow position was set up by dragging the mouse to pull the string all the way back, then up one position. All that remains is to drag the mouse laterally, without releasing the mouse button, to correctly position the arrowhead point. In several games, the sweet spot was somewhat to the left of the short horizontal black line on the target rock spire. In some games, this spot was immediately to the left of the line, in others it was as far as halfway to the edge of the rock spire. Your mileage may vary. "Success! You are a skilled warrior"
and a sound of rock sliding. Move B R2 F3 R F3 and listen to the sound of thunder while watching an animation of stampeding buffalo. Alternative Cave Access. As Roy Pascarella pointed out in the comp.sys.ibm.pc.games.adventure newsgroup, it's possible to back into the south cave without shooting the arrow. From your position at the mounted bow, move B R2 F3 L B. Even though the compass rosette now indicates you can only move forward, instead move L F2 into the south cave. Using the Anasazi map, return to the calendar control lever and set it for West. From your position facing the calendar lever, move B R F9 R F L F12 L F2 R F6 R F and pick up the flashlight in the geode cave. Move B L F to the first cave shadow. The professor's journal mentions corroded batteries in the flashlight, so you'll have to shake it to get some light out of it. You can see only a portion of the symbols hidden in shadow at any one time since the flashlight beam is limited. Make a note of all symbols you see, you'll need them later. Be sure to also check the second cave shadow to the left. When you get it right, a really cool shadow of a coyote will cross the rock and you'll hear him howl. Move L and click on the West sun spiral carved into the rock. Move R F2 R into the emerald cave and note the Anasazi sun symbol rising out of the water. Move F to get a closeup of it, and note the sound of dripping water. From your position facing the calendar lever, move B R F11 L and pick up a feather lodged behind the rock. Move F2 L F3 R F6 L F5 and put the feather on the ground in front of the decorated gray stand. 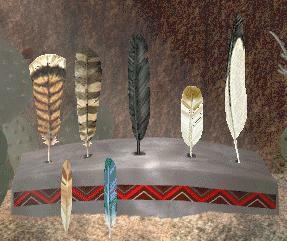 then click on the feather on the wall to turn the gray stand into a full headdress. Move B L F R F and note the bird sculpture and the sound of wind. Move R2 F L F R F4 R F6 L F2 back to the crossroads. This section of the game is optional - you don't need it to finish the Anasazi world, but it's worth visiting for the music alone. But be careful! One wrong move and you'll have the restart the puzzle from the beginning. Move R F2 - if the rattlesnake puzzle has been solved, the peacepipe will be smoking and you can click on it five times for Anasazi storyteller sequences. Move B R for an alternate map of the Anasazi world. 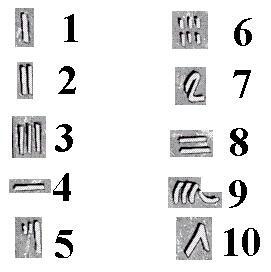 Then press the spiral symbol above the tablets to open a passageway. If you've correctly selected the eight tablet symbols and the passageway does not appear, revisit the caves at the four compass points to make sure you've actually heard the natural sound associated with each one. From your position at the tablets, move F5, pick up the Anasazi gene pod and watch the movie. After it completes, note the leaf outline exposed under the pod. 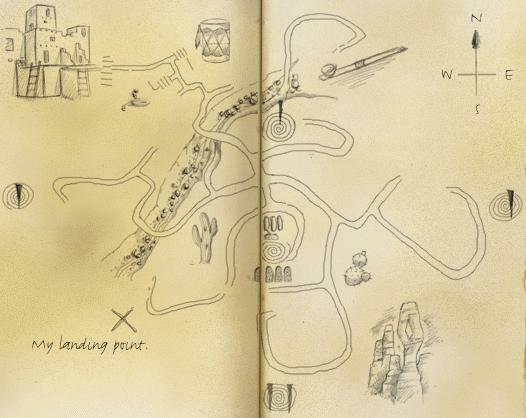 Exit the purple cave and use the Anasazi map to return to the crossroads. From the crossroads, face north and move F10. Pick up the spear and move B L. Use the spear to chop holes at the bases of the three cacti (some of the prickly pear may have to be chopped away before you can get at the left one). When you've released water from a cactus, it flows to the green corn plant at center. The plant requires five waterings in order to grow tall enough to climb into the cliff city, so you'll have to chop a second hole in the barrel-shaped cactus and one at the base of the left arm of the right cactus. Move F3 R and pick up the blue-handled rattle inside the basket. Move R2 and click on the rattlesnake to hear its rattle. Emulate the sound with the rattle you're carrying by sweeping it down, up, down, down. The snake then morphs into a ladder; move F6 R into the loom room. Drag the large medium-red yarnball from the bowl to the empty white basket at right. Drag the shuttle in your inventory at lower right to the white basket. Click on the yarnball to unroll some yarn. Click on the shuttle to thread it with the yarn. With your mouse cursor, click on the white-threads area of the loom. Click on the sliding horizontal bar to complete a portion of the blanket. Repeat the above procedure using the small dark-red yarnball and the red-and-yellow striped yarnball. 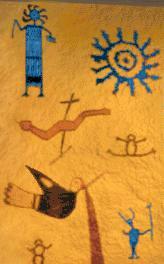 The blanket will then be complete and you'll see a glowing representation of a corn plant, an important Anasazi symbol. The wind chime will answer with its cadence and a doorway into the shaman's room will be revealed to your right behind the animal skin. Enter the shaman's room and move forward to the firepit. Pick up a glowing piece of wood and turn left. Drag the glowing end of the wood over the five cavities at the top of the wall to disclose various dangers (including more bees in the center hole). You can see a rag in the hole second from the right - take it. Turn around and dunk the rag into the stone pool of water, then use it to clean the wall and disclose a reindeer-style pictograph, another important Anasazi symbol. Back out and pick up the outlined leaf at the back of the sandpit, now turned brown. 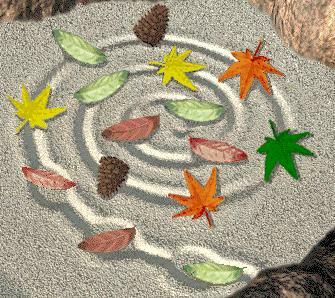 Move R F L F3 R F4 L2 and place the brown leaf into the depression by the music room door, opening an entrance to the kiva straight ahead. Move F5 into the kiva. 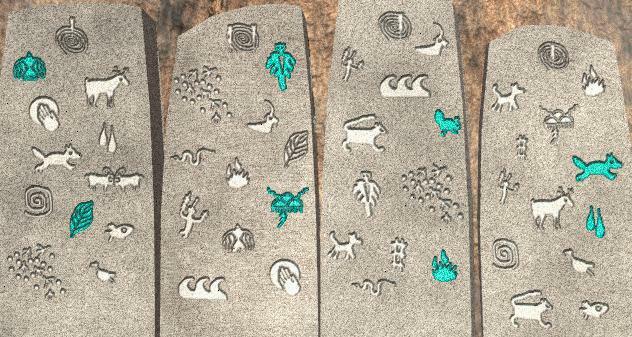 The object of the kiva puzzle is to correctly identify exactly seven Anasazi images you've encountered in the game. The design on the west wall is circled by 7 blue arrowheads, each of which brightens when one of the correct wall images is lighted in blue. Turn right and note that all seven blue arrowheads are now glowing. Click on the center of the circular design to open a door in the wall; move F B4 R2 F10 into the Anasazi time portal. Watch the movie of the Professor, then wait a few moments and watch a second one. Press the central paired-dolphins button, then click on the animation in the crystal ball to be transported to Atlantis. From your landing point in Atlantis, move L F2 R F6 into a windowed pyramid building and to a view of a map of the Atlantis world. Move R2 and note the "4"-like symbol associated with this building. Move F L F and view a movie sequence on the video player. Move R2 F2 for another movie sequence. Move B L F5 L F R F9 R F10 into an aquarium-like building housing a glowing DNA helix. Move L2 and note the bent-square symbol on the floor of this building. Move F R F and view a movie sequence on the video player. Move R2 F2 for another movie sequence. Move B R F8 R F4 R F L F8 L into a schoolhouse-like building. Above the side door, note the steering-wheel-like symbol associated with this building. Move R2 F and view a movie sequence on the video player. Move R for another movie sequence, R2 for another, and L F R F for five more (with Greek subtitles), including some from the Guardian robot. Move B L F8 L F R F4 R F6 into a truncated pyramid building and note the curved "+"-like symbol associated with it. Move R F and view a movie sequence on the video player. Move R2 F2 for another movie sequence. Click on the far-right button with the small circle to activate the elevator. Move B L F2 L2 and click on the rightmost of the three paired-J symbols at the bottom of the window frame to descend to the lower level. Move F R F and take the sparking red crystal from the robot. Move B R F R2 and put the crystal into the receptacle under the window to reactivate the elevator. Click on the leftmost of the three paired-J symbols at the bottom of the window frame to ascend to the upper level. Remove the crystal and move into the stasis chamber rooom. You are now under a time limit to deal with the robot Guardian before he finds you and sends you to eternity, ending the game with a few newspaper articles. To accomplish this, you will lay a trap for the Guardian using one of the stasis tubes. Move B2 and bait your trap by putting the crystal on the stasis tube floor (this has to be done by dragging the crystal so its lower triangle is just below the lower edge of the game window). Move L2 F2 to the hexagon puzzle controlling the stasis tube gun. Save your game at this point as an arcade-style sequence is coming up. Click on the central red hexagon button and back out. When the robot appears, shoot him in the chest (ow!) a few times to drive him back into the stasis tube. While he's in there, quickly fire on the dark circle above the light panel in the tube to activate the stasis field and trap the Guardian. Move R L F L F5 R F and open the gene pod receptacle. Press Ctrl-G to bring up your gene pod inventory, and click on any of the pods to transfer all three to the receptacle. Pick up the receptacle and move B L F7 to the transmission panel. Click on the central bent-square symbol and put the gene pods you're carrying into the depression formed in the panel. You now have two minutes to leave Atlantis through its time portal, or you can wait it out for the same endgame sequence. To reach the time portal, move B L2 F6 R F7 and watch the Professor's Steve Martin impression (boy, he's really scared, isn't he?). If you try to transfer back to Easter Island, the time portal melts and you get the same endgame sequence. An alternate ending in which you stay on Earth is possible if you hightail it back to the elevator before the two-minute pre-launch period elapses. Some of the writing in the journal flows off the page onto the black screen background. All video sequences have very bad lip sync (local bus video card used, per game recommendation). Would have preferred the movement direction rosette not disappearing every time the mouse is used. The save-game query on exiting the game is sometimes irrelevant. The CD-ROM automatically ejects without warning. An annoying white Timelapse rectangle gets stuck at the lower left of the screen whenever the program is minimized, then reactivated. A really chintzy CD-ROM "case". Four CD's, and none of them with an audio track by the Mesa Music Consortium.